Access this book on Amazon.co.uk. Whether you’re a parent, holistic therapist or traditional health-care professional you will probably at some time or other be gripped with the fear that a child under your care could be dangerously exposed to a killer or severely debilitating disease, one that may only be avoided by some life-saving vaccine or pharmaceutical medication. But just where does this fear come from? Even traditional health-care professionals struggle to explain the science behind how some children “catch” or “succumb” to these dangerous diseases like Meningitis, Encephalitis and Polio and yet most of the ‘bugs’ associated with these killer diseases reside in and around our bodies all the time, in the vast majority of us, without any ill effects. Why is it that only a very small percentage of people get ill from these bugs when most of us don’t? And therefore how can some vaccine or drug be an antidote to something that is already a part of our inner microbial world? Clearly some other factors must be instrumental in the causation of disease and if vaccines don’t address these factors, do they actually work? And when it comes to herd immunity, do vaccine promoters really expect us to believe that people who have been vaccinated are no longer carriers of these killer bugs, when standard microbiology tells us that they are. So why have we allowed ourselves to become so frightened of microbes that live mostly in harmony with us all the time? To attempt to answer these questions we have to go back in history to Louis Pasteur and his friends who promoted the idea that ‘germs’ (external to us) are the primary causes of disease and that these diseases can be passed on from one person to the other. Ever since this time, the pharmaceutical industry have marketed and promoted this concept, so that now it is believed and accepted as a fundamental truth of how we become ill.
Killer diseases like; SARS, Bird Flu, Swine Flu, Ebola etc and yet we now know they never did! But every time a new disease threat was publicised and vaccines promoted, the government, health authorities and the general public, accepted the scare stories and exaggerated risks of the disease time and again, whilst the industry underplayed the dangers of vaccines and overstated their benefits. The swine flu pandemic that never was is an extraordinary story of bad science, fortunes made, public money wasted and fear-mongering on a mass scale. Could there be anything similar about how the pharmaceutical industry over-hypes global pandemics like Swine Flu and how they sell us into believing our children are at risk from the bugs that mostly live in harmony with us? To answer this question we need to look at the vaccine industry’s fundamental arguments for the success of vaccines… because of course, if they can prove vaccines are safe and effective then it would be a simple open and shut case – we would be duty bound to vaccinate our children asap because that would simply make sense! However, when the real evidence is unravelled and presented in a logical manner, the messages from the pharmaceutical industry appear more like wishful thinking than established scientific fact? The historical success stories for vaccines have been vastly overstated in claiming that vaccines have been responsible for bringing down rates of disease. (See chapter 4 for more details on how statistics have been misinterpreted to support the vaccine success argument). The core argument for the validity of vaccine science i.e. Antibody theory is also simplistic, outdated and flawed (see chapter 3, 4 & 10 for more details of how this old theory was left behind by immunologists(immune research scientists) since the 1940’s). Even the head of the largest immunisation organisation in the world accepts that you can have immunity in people with no or undetectable levels of antibodies. 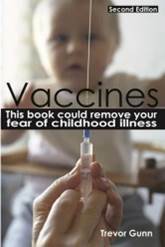 When vaccines are suspected of not working or causing problems, the results are often obscured with the biased reporting from health officials, (see chapter 6 to hear how they turn a blind eye to embarrassing facts about the unexpected disease rates in vaccinated children). Vaccines contain toxic ingredients; heavy metals such as aluminium, a common additive, and mercury still present in some vaccines, mixed human and animal genes, contaminant viruses, preservatives, and other chemicals, that we know from many studies are dangerous to humans and cause adverse effects such as; anaphylaxis, asthma, eczema, diabetes, meningitis, brain and nerve problems, (see chapter 11 for a shocking insight into what your children are being injected with). With such potentially lethal chemicals used to manufacture vaccines you would think that vaccines are even more rigorously tested than prescription drugs – You’d be dead wrong! (See chapters 3, 4, 11, 12 and 13 for more of these insights). Around the world governments pay out compensation on vaccine damaged children, but these payments are not publicised (see chapter 11 to learn more about these payments). If you would like to have access to all this information and more, you can click on the link below to Access this book on Amazon.co.uk. If you would like more information then read on……..
How confident do I feel about vaccinating my children or indeed myself? Some people would rather not look any further, fearing that there is no way forward, but remember there is information available that makes things simpler not more complicated. Some people attempt to criticise those that try to honestly draw attention to the unanswered questions behind the vaccine industry and accuse them of being scaremongers and conspiracy freaks. But the real story is not the conspiracy, the neglect or even the self-serving agendas of the drug industry, but the story of an orthodox medical profession with a limited mind set and a perception of the human body that is fragmented, linear and lacking in overview. Because it’s a perception that is ultimately blind to the damage they are inflicting on the health of our children, and blind to the fact that the human body is continually providing signals for simple, safe and effective solutions for what it needs to get healthy (see chapters 7, 8 and 9 for more details of what these signals are and what they could mean for you and your children). Systematically exposes the scientific double-speak that is often used to side-step serious attempts to address questions of vaccine safety and effectiveness. It will provide you with all the previously hidden, ignored and misunderstood information about vaccines that you need in order to come to your own conclusions about their safety and effectiveness. It will help balance the one sided and never-ending torrent of misinformation from the pro-vaccine marketing machine. Therefore the second section of this book will focus on ‘The New Science of Health and Healing’ and its relationship to supporting our children’s health. It presents a common sense scientific and holistic explanation for how we get sick, how we can avoid becoming more seriously ill with flawed treatment choices and what we can do to support our bodies during the healing process. You’ll have a transformational experience when you realise that viewing illness from a different perspective removes its fear, avoids poor treatment choices and improves health naturally. This easy to read book is jammed packed with hundreds of pages to help you learn more about the health risks your children are being exposed to.